Ruth Davidson is to appear on a celebrity episode of the Great British Bake Off. The Scottish Conservatives leader will feature in a charity special of the Channel 4 programme later this year, the party has confirmed. The episode will be broadcast as part of Channel 4's Stand Up to Cancer campaign. 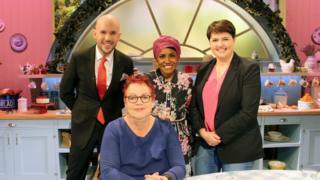 The Edinburgh Central MSP was a guest on spin-off show An Extra Slice last year. Ms Davidson has previously appeared as a guest on BBC2 comedy programme Have I Got News For You. She follows in the footsteps of former shadow chancellor Ed Balls, who took part in a celebrity Bake Off special in February 2016. Other celebrity contestants have included comedian Jason Manford, singer Will Young and track cyclist Victoria Pendleton.